Join ChaiVillageLA after Friday Night Shabbat services for a speaker and discussion. 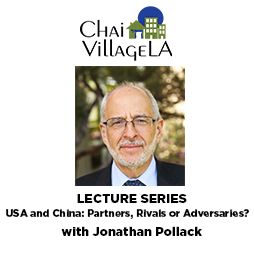 ChaiVillageLA member and East Asia expert Jonathan Pollack will explore US-China relations over the past century by highlighting key aspects of the history. These include the misperceptions and miscalculations that have characterized the relationship and the risks and uncertainties involved. Per Jonathan Pollack, the third talk will focus on China's economic and military advances and how the U.S.'s increasing awareness of China's growing strength has Americans so agitated. Coffee and dessert will be served after the event.